Deeping Rangers celebrate their Lincs Senior Trophy win. Deeping Rangers were celebrating last night (April 3) after winning he Lincolnshire Senior Trophy. Michael Goode’s side beat Grimbsy Borough 4-3 on penalties after the final at Lincoln United ended goalless. Despite Henry Dunn seeing the first penalty of the shoot-out saved, Cameron Johnson, Scott Mooney, Charlie Coulson and Dan Flack were all successful with their efforts. 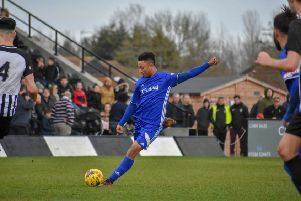 Borough, who play in Division One of the Northern Counties East League, converted their first three spot-kicks before Daniel Trott’s effort was saved by Lewis Elsom. Peter Winn then missed the vital final spot-kick which handed victory to Rangers. Elsom also saved a penalty in normal time when he kept out Jack Debnam’s effort early in the second half. Both sides hit the woodwork during the 90 minutes. For Deeping, Dunn hit the post in the first half and skipper David Burton-Jones headed a Coulson corner against the bar in the second half.